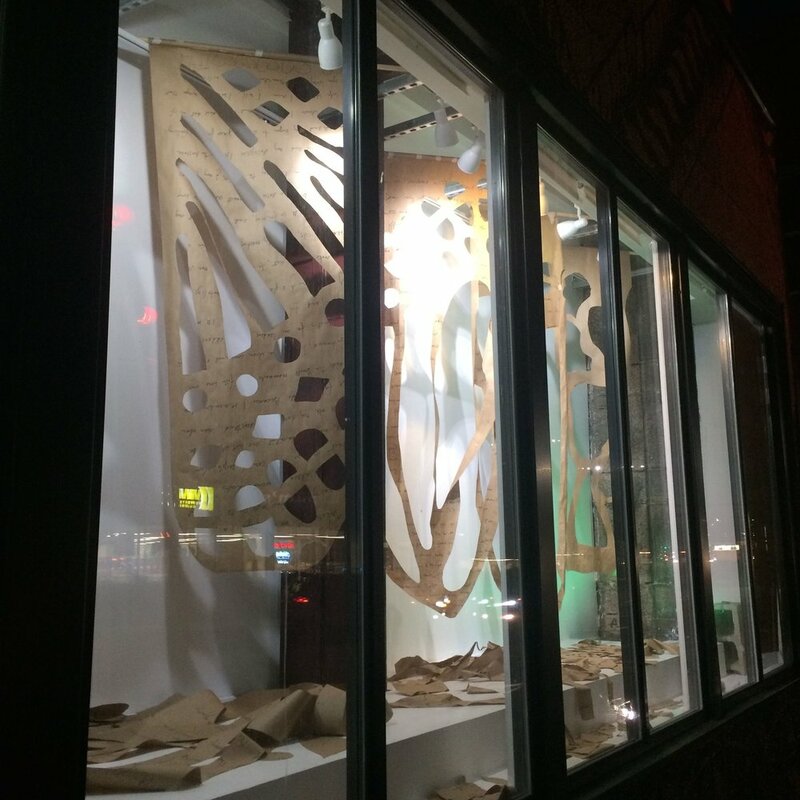 Since Thursday February 15, I've been working on a residency/installation in the window gallery of The Dirt Palace in Olneyville Square. I'm pleased to announce that you can see it fully installed until Wednesday March 14. The work is called HOST, partly because I felt like I was well hosted by Pippi Zornoza and Xander Marro and the women who call the Dirt Palace home, but also because I feel that hospitality is at the foundation of all my artwork, definitely all my theatre work. I also remembered hearing a radio interview with a scientist describing the process by which caterpillars transform into butterflies; there is no actual transformation from one creature to the other. If you were to split a cocoon open in the middle of a pupa's process, you would find neither caterpillar nor butterfly, but rather a goo, made from the engorged caterpillar, upon which the nascent butterfly feeds. The caterpillar essentially hosts the building blocks of the butterfly, called imaginal disks or cells, and is ultimately consumed by them. I identified completely with being in the goo, no longer one creature and not yet the beautiful pollinator I'm named after (Vanessa is a genus of butterfly that includes the species of Painted Ladies and Red Admirals.) So, I used the window as a residency space, posting working hours and building the parts of the installation while cocooned in the window. For 14 days I visited the window and worked on objects, short videos, and writings that figure in the final installation. A caterpillar takes between 10-14 days to go through its larval stages, and another 10-14 days to transform into a butterfly; the duration felt right. I logged my time IN and my time OUT, as well as the temperature that day, and how many people passing by actually acknowledged me working by greeting me, as well as the number of visits I received. I would set up my webcam and work in Jitter and document my labors. For the people who walked by during the time I was not in the window, I left a monitor playing that day's video. In that way, there was always work happening in the window. 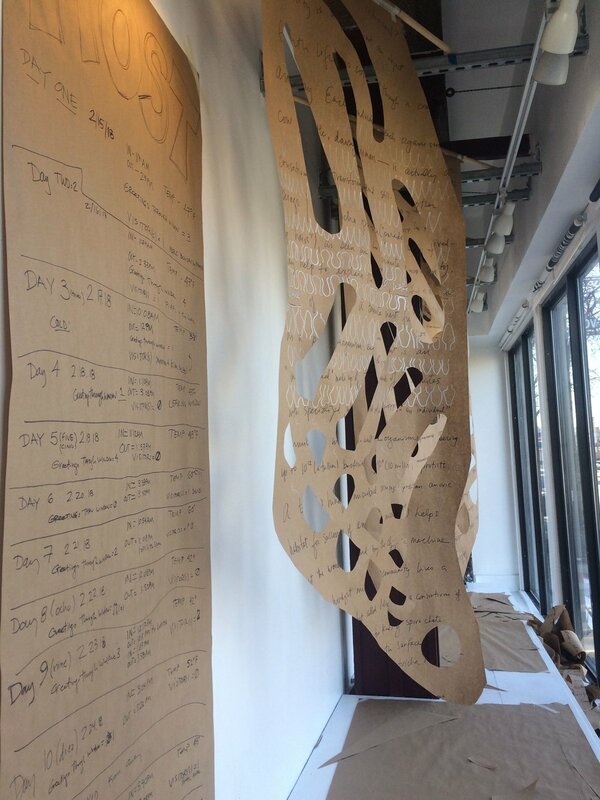 I rolled out long sheets of paper and wrote on them- about what I love about Providence, about what it feels like to be in the proverbial goo, and copying out some remarkable text about evolutionary biology and how identity is a process. Once inscribed, I cut swooping shapes out of the paper, rendering them into butterfly wings, ready for me to assume, once I've popped out of the cocoon. The cut paper remains in the space, evidence of the work that has taken place. The installation is on view, 24 hours a day, through Wednesday March 14, when I'll clear it out. If you aren't able to see it in person, stand by for a gallery of images that I'll load up to my website. And if you are the kind of person who enjoys bibliographies and source materials, know that I am very tickled and inspired by the work of Sophie Calle and Yayoi Kusama and this work, HOST, is very indebted to Jen Long for the introduction to the concept and reality of Imaginal Cells. You can read about them HERE and also about how evolutionary biologist Elisabet Sahtouris considers these cells important, HERE. Many Thanks to Pippi Zornoza, Xander Marro, and the denizens of the Dirt Palace for hosting me for this cold month in the window. Additional thanks to the Providence Department of Art, Culture & Tourism for supporting the window activities. After a bracing and rousing week at Mass College of Liberal Arts working with Diversity Fellows! on the newest iteration of Training Day, I'm back in Providence embarking on an installation/residency project in the window of the Dirt Palace, a feminist art space in the Olneyville neighborhood. 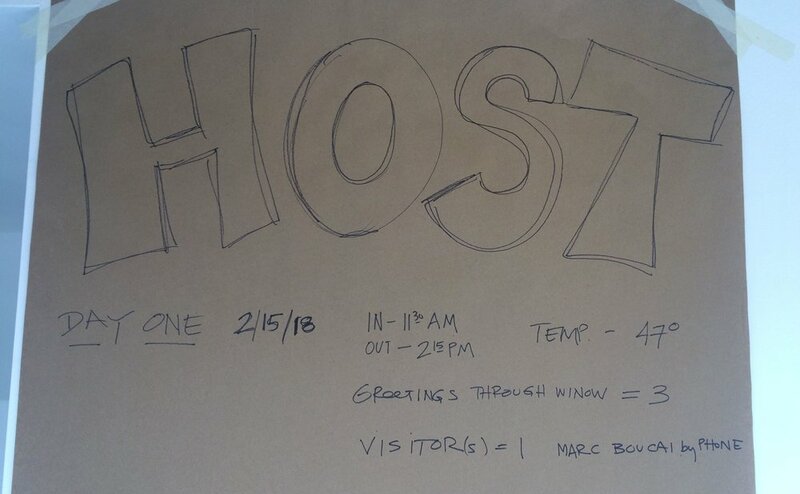 HOST is a durational work in which I'll keep studio hours in the window, making some sculptural and video experiments that will remain when I am not in the space. Taking a page from the playbook of Sophie Calle, I'll catalogue my social interactions while considering the way that the window interacts with the neighborhood. Please check out the work during studio hours! I'm pleased to share that I've been awarded a Rhode Island State Council on the Arts scholarship to attend the 2017 Alliance of Artists Communities conference in Denver in October. This scholarship is a great boost as my husband David and I look to formalize our habitual hosting of artists and scholars into a proper Artist Residency Program. We've been operating ad hoc for several years out of our home in Providence, giving space, feedback, and excellent grilled food to wayfaring artists, but now we want to add some space and dig into a community even deeper. Participation in the AAC conference will fertilize our thinking. Stay tuned for more adventures and musings. Scars of war never disappear. It is April 2017, Easter Sunday, and I am thinking about the fact that a week ago, the centennial of the US' engagement in the Great War passed without much fanfare or reflection. That the US marked the occasion by dropping what has been termed "the Mother of All Bombs" on Afghanistan is on beyond ironic when we consider that that first big war of the 20th Century was meant to be "the war to end all wars." 99 years since the Armistice was called, world powers, the US especially, are still war-hungry, consuming resource after resource, burping out toxicity and trauma. Perhaps it is timely then, that David Higgins and I are revisiting Over the Top, our World War One play with a game and a snack for the audience, graciously given a slot in the Wilbury Group's Festival of New Works. The work is ambitious, stitching together a play that David wrote about 8 years ago with some games that we play with the audience and a durational performance action attempting to account for every casualty of the Great War. Overall the work is intended to serve as a living memorial, one that demands our physical labor and attention rather than an obelisk rendered in granite or marble. We hope you can join us as we attempt this newest iteration, fresh with new cards, added video and the introduction of snack food, on Wednesday April 26 at 7:30pm. Entry is PWYC (Pay-What-You-Can) and we are performing at the Wilbury Group's home theatre in the Southside Cultural Center in Providence. Your fearless readers include Jim Sullivan, Vince Petronio, Kate Lester, Robyn Geogan Noble, Stuart Window, Corinne Walhberg, Nate Talbutt, and David Higgins. For more information about the process and the play's history, find us HERE. Hope to see you in the theatre. Hope you'll venture out to see some bodies attempt to record and extend some history. Bonky Dolls/Instant Opera Company pops up at the PVD Fringe July 29!!! On Friday, July 29, at 8:45pm and 9:45pm, Bonky Dolls and the Instant Opera Company will perform its premiere production, The Haunting of Buzzards Bay, as a pop-up performance in the Fringe PVD 2016 festival. 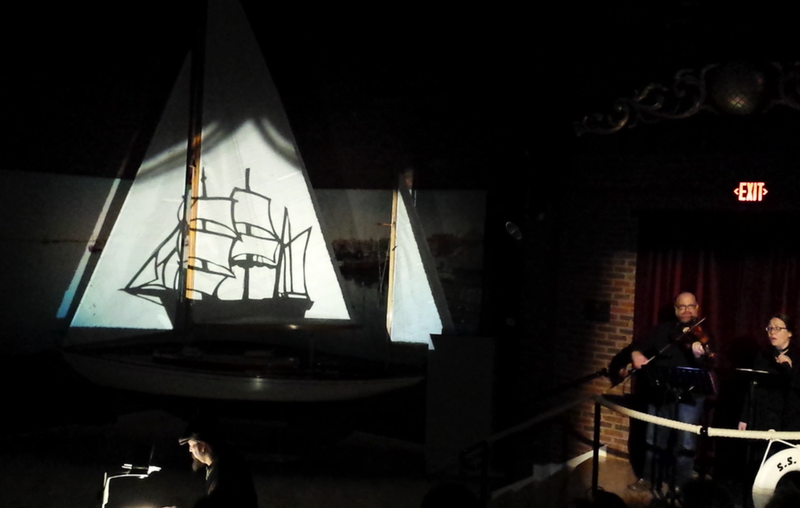 Built for the culture*park 13th Short Play Marathon in November 2015, The Haunting presents the story of a 19th century whaler returning years later to his beloved New Bedford to find it irrevocably altered. The show features story and shadow puppetry from David Higgins, story and vocals by Vanessa Gilbert, musical direction/viola accompaniment by Jeremy Fortier and all-around great manipulation by Stuart Window. To see the show, gather at Grants Block in Providence (the corner of Westminster and Union Streets) at showtime, and a performer will conduct you to the adjacent, indoor, venue. Sleeping Weazel pops up at the Boston Theater Marathon! Sunday, May 8 isn't only Mother's Day, but the day that Boston Playwrights' Theatre presents the Boston Theater Marathon, 50 10-minute plays penned by Boston-area playwrights and produced by Boston-area theatre companies. I'm directing This is Marriage, a short play by Sleeping Weazel artistic director Charlotte Meehan and featuring actors Veronica Wiseman and Steven BarkhimerWe're on at the top of the final marathon hour (9pm-10pm) but lots of noteworthy writers will be featured all day! All proceeds support the Theatre Community Benevolent Fund, a non-profit organization for theatre artists and organizations in dire need of financial relief. 2016 gets off to an exciting start! I am pleased to report that I will be presenting my paper, Cry You One: Participatory Possibilities through Strategic Siting at Connecticut College's 2016 Ammerman Center for Arts and Technology Symposium: Open All Ports. The paper describes the New Orleans- based ArtSpot Productions/Mondo Bizarro performance Cry You One and tries to define the space that the work creates between the physical sites that they have performed on and the website that contains several short digital stories. I'll be on a panel about space/access and couldn't be more thrilled. I often expound on how theatre is a form of hospitality, and I just found an article, put together by the far-thinking Charlotte Meehan of Sleeping Weazel for Howlround on The Means of Production. Even though the article is three years old and I no longer run a theatre company, I strongly believe that the foundation of performance practice is a form of hospitality, of invitation, whether you are inviting something new to come into the world in the form of a performance or you are inviting other people to share in something you have created. We're reading our script on August 24!!! My first collaboration with Justine Williams and Eva Peskin received a wonderful reflection on Culturebot! Stay tuned for our reprise of There's Nothing to See Here in September! I can put any content in here.